A glance at the biggest – or most eyebrow-raising – stories from the last seven days in Argentina. The issue of corruption escalated throughout the week with both Carlos Stornelli (the prosecutor in the “cuadernos” corruption mega-trial) and Federal Judge Luis Rodríguez caught up in furious cross-fires yesterday, although the biggest initiative came from Federal Judge Claudio Bonadio, who in midweek was summoning people in industrial quantities – first 100 businessmen alongside ex-president Senator Cristina Fernández de Kirchner and several of her officials and then 92 mayors, all for graft. A busy week also saw Carolina Pochetti (widow of Daniel Muñoz, private secretary to the Kirchner presidential couple), former Santa Cruz provincial economy minister Juan Manuel Campillo and accountant Víctor Manzanares (the only key witness who still refuses to be a whistle-blower) indicted while Martín Baez, the eldest son of Kirchnerite public works contractor Lázaro Baez, joined his father behind bars on Thursday for seeking to transfer allegedly ill-gotten gains under injunction. It was Pochetti who landed Rodríguez in trouble by confessing to having paid the judge a bribe of US$10 million – the Magistrates Council will be looking into these and other charges, which the judge denies. Prosecutor Stornelli was suddenly forced on the defensive yesterday when journalist Horacio Verbitsky, via El Cochete a la Luna, accused him of trying to extort via his alleged middleman Marcelo D’Alessio up to US$500,000 from businessman Pedro Etchebest in return for not investigating him on suspicions of collecting bribes on behalf of Campillo. Stornelli denied the accusation as a “cheap shot” but will still be investigated by Dolores federal judge Alejo Ramos Padilla. The list of businessmen includes President Mauricio Macri’s cousin Angelo Calcaterra and such construction kingpins as Claudio Wagner, Aldo Roggio and Gerardo Ferreyra while few of the 92 mayors from 15 different provinces (but mostly Buenos Aires and Chaco) were big names apart from Jorge Capitanich, mayor of the Chaco provincial capital of Resistencia, while there was nobody from Greater Buenos Aires (except Quilmes ex-mayor Francisco Gutiérrez). Phew. Did you get all that? 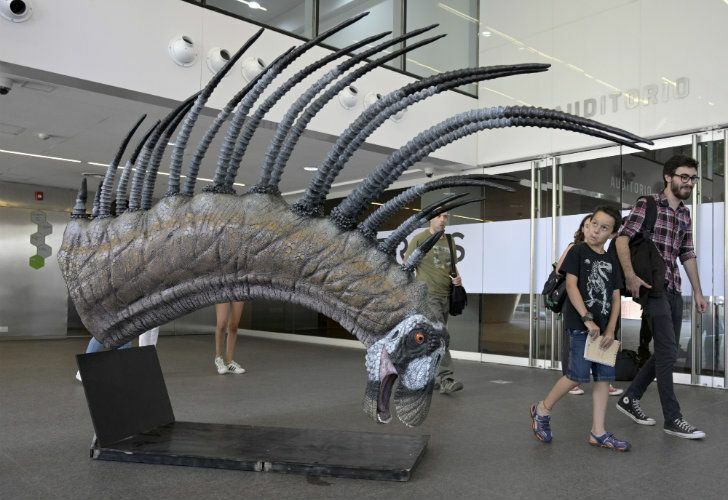 A herbivorous dinosaur that fended off predators with a row of spines running along its back and lived 140 million years ago has been found in Patagonia. The discovery of the new species of dicraeosauridae, christened “Bajadasaurus pronuspinax,” was revealed in scientific journal Nature. 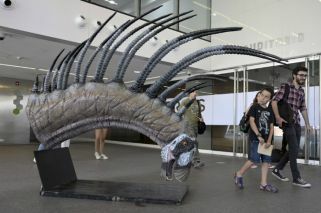 A reproduction of its spiny neck was exhibited in the Cultural Science Centre (Centro Cultural de la Ciencia) in Buenos Aires. President Mauricio Macri turned 60 yesterday at the end of a week in which he admitted to having been “over-optimistic” against inflation and to a “black December” at the end of a “traumatic” year after INDEC statistics bureau reported inter-annual plunges of 20.5 and 14.7 percent for construction and manufacturing respectively. But Macri insisted that there was no alternative to fighting inflation. The dollar closed the week at 38.92 pesos. Less stable was country risk, which, after moving down towards 600 points early in the week, closed yesterday at 673. The Federal Capital Appeals Court on Tuesday removed judge Sebastián Casanello from the case investigating bogus campaign contributions to the ruling Cambiemos (Let’s Change) coalition in 2015 and 2017 on the basis of charges first lodged by centre-left politician Margarita Stolbizer. 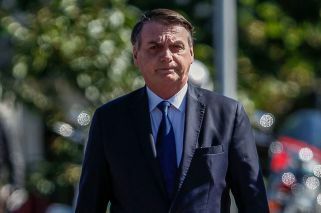 The court considered Casanello’s handling of the case to be “erratic,” thus adding fresh confusion to a trial already facing a conflict of jurisdiction with La Plata courts since Buenos Aires province campaign finances are also involved. A new federal judge must now be chosen by lot. CHUBUT: IT’S THE FOREIGNERS, STUPID! Chubut Governor Mariano Arcioni signed a decree on Wednesday banning the entry of any foreigners with a criminal record (even where a conviction is under appeal) and expelling them from the Patagonian province if they have already arrived. The decree was quickly criticised for overriding the principle of “innocent until proven guilty” both in the cases of convictions still under appeal and those who have already served their sentences. But Chubut provincial Government Minister Federico Massoni insisted on linking a rising crime wave in Chubut to the increased entry of foreigners in the last six months, especially from Venezuela, Colombia, Paraguay and Bolivia. Netflix was obliged to say it had nothing to do with Codicia (“Greed”), an apparently yet to be made mini-series on Kirchnerite corruption by the journalist Jorge Lanata, after a furious backlash from Kirchnerite militants in the social networks under the hashtag ‘#ChauNetflix’ calling for a boycott of the platform. Although fictional, the series will include interviews with real protagonists. The third mission monitoring Argentine compliance with its agreement with the International Monetary Fund (IMF) will be starting work this Monday without ruling out meetings with the opposition, in light of the uncertain outcome of this year’s elections in order to ensure continuity. At a more technical level there are also worries that falling revenue figures could oblige the government either to intensify austerity or to apply for renegotiation with the IMF for laxer terms. IMF spokesman Gerry Rice did not confirm that the team headed by Italian economist Roberto Cardarelli would be meeting with the opposition but nor would he rule it out when consulted by Argentine correspondents in Washington. Last month IMF Managing Director Christine Lagarde met with Economy Minister Nicolás Dujovne and Central Bank Governor Guido Sandleris at the World Economic Forum in Davos, Switzerland. Rice also said that it was “premature” to speak of an IMF programme for Venezuela with no contact with that country since 2004 but pointed out that the Venezuelan economy had been halved since 2013. The Tecpetrol division of Techint Group on Thursday formally impugned the government’s subsidy cuts in the Vaca Muerta shale deposits as affecting “acquired rights” under Article 17 of the Constitution, complaining in writing to the CNV Securities and Exchange Commission and to the Buenos Aires Stock Exchange. The government changed its criterion for subsidies from actual to anticipated production after the former doubled the latter, costing the multinational 5.6 billion pesos according to its own estimates. As a result Tecpetrol announced that it would be withdrawing plant and suspending 300 workers.